Access: N 634, Km 511. Our campsite is located in Luarca. 600m from the beach and 300m Otur the N-634 (future A-8). A 100 km from Oviedo, 90 km from Gijon and Aviles 64 Km. Otur connected with train (LVEF) and bus (ALSA). The Camino de Santiago runs at 300m North of the campsite. Near the beach Barayo, naturist beach, Partial Nature Reserve special ornithological interest and transit of migratory birds. Area of geological materials by quartzite, attributed to the Primary Era (Paleozoic). Lower Paleolithic sites that could be traced back to 50,000 BC mycological interest area. Activities: hiking, riding, quad, fishing, swimming, diving, canoeing, surfing, golf, rafting and canyoning, climbing techniques (boulder). Variety of flora and fauna, oak, chestnut, birch, yew, holly, mycological species ... and otters, cormorants, salamanders, newts, frogs, skinks Iberian. EXTINCTION endangered species. Establishment of 2nd category, has 80 pitches, 69 for camping with parking, of which 32 have electrical connection. The reception and dinner with no barriers. The services have free hot water. We also have a washer and dryer. There is a wheelchair accessible adapted toilet. Multipurpose room of about 38m2 for groups to carry out activities. Service Free Internet via wifi in a wide area around the cafeteria. 11 bungalows, with the following distribution: porch, lounge, kitchen, bathroom, bedroom with double bed and another room with a bunk bed and a low (maximum 5 people). The bungalows are 3.5 m2 Extra more than normal. Staffing and kitchenware: A fridge, heating and hot water. With sheets and blankets but no towels. Kitchenware for cooking. Do not have a TV or microwave. The bungalows are not pets but if they are admitted to the campsite. We have experience in care groups. 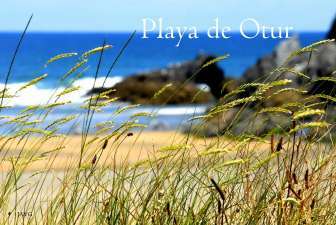 Bathed by the Cantabrian Sea, this shore Spain offers some of the most beautiful and spectacular landscapes of our coastline with beaches located in areas of great natural beauty. The make up the San Lorenzo beach, sandy clay, sandy Salinas, Caravia beaches, beaches Carreño, Castrillon beaches, beaches Cudillero, where it is nice to enjoy a variety of fish and shellfish.